Ask the fashion-ignorant layperson what he or she knows of Jean Paul Gaultier and the response will place the respondent in one of two groups: those who remember Madonna's Blond Ambition cone bra and those who wear the Gaultier fragrances. In the 21st century, the popularity of the scents has eclipsed the popularity of the singer. Both singer and designer appear to have outgrown their most highly controversial inclinations, even if the straight male population is still affronted by the Gaultier men's cosmetic line that includes the semantically dodged Sneaky Kiss lip "balm." 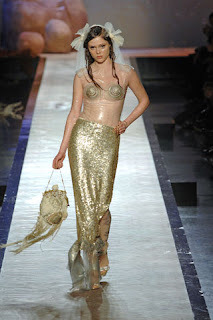 The theme of Gaultier's Spring 2008 couture show was mermaids and the men they cause to wreck upon the rocks (or involuntarily asphyxiate). Pretty, some said, ergo for Gaultier innocuous. The runway hosted a briny, mythological kingdom with knife-cut shoulders on whippet-thin suits. And if not tails of cod and scales of scrod, then those multicolored yet anonymous Mediterranean fish that are tossed heads and all into a proper Marseilles bouillabaise. Mermaids and sailors are hardly the stuff of contention. The controversy proceeding Gaultier's separate explorations of Hasidic apparel and acceptable modeling weight makes the sea creatures almost Disn eyesque by comparison. As a result, there wasn't all that much to talk about. In a season that saw the retirement of Valentino and the brute force of Chanel, Gaultier simply presented a mix of concepts and solutions. One might not wear, as Coco Rocha did, the Thessalonika bra, but one could easily solve any number of fashion quandaries with the magnolia-white suit walked by Chanel Iman. Emotionally, though, the collection was true to Gaultier's past performances. This past includes the questionable payoth of the Hasidic collection and everything else Gaultier has done that has raised eyebrows and hackles. Theme and simile aside, Gaultier once again took the observer to the nearest faraway place. This is quite a different destination than that of Galliano, whose place for women this season was not nearby at all. Gaultier's nearest faraway places--wherever they may be--are ones that are familiar to recognition but foreign to experience. We may see the Hasidim on the streets of Borough Park, we may wonder why they do not manicure their sideburns, but we do not and cannot have their experience unless we are one of them. If we are not mermaids, we cannot flip our tails in the Aegean. An interesting observation about fashion is that if it is to repeat itself, it must have had some token in the first instance. The seventies are back, or hadn't you heard? Halston isn't dead, he is alive and well and living at Net-A-Porter. The observation is especially true of Lacroix, Valentino, Armani, and the Blond Ambition bra. Yet, tokenless (non-repeatable) haute couture is generally the haute couture that creates stir and excitement. As the fashion generally held to be closest to art, it also is the one to provoke artful polemic. The pieces at the center of the fashion versus art debate are inevitably those that are barely adaptable to normal usage. There wasn't much room for adaptability in the referential cone bra, but there was in the gold-scaled skirt that accompanied it down the runway. Alone, the skirt was a model of reduction and could easily be seen as a seasonal essential. "Beauty," Michelangelo said, "is the purgation of superfluities." The meaning of this statement is clear when it is applied to the more streamlined and less vocal designers. We dispense with frill, flounce, and fins and leave only what is essential to highlight the body and what makes the body function as a basic shape. It is the shape of the body that is beautiful, not the clothing. Shoes and ambition were problematic in several instances this season. Lagerfeld's timid models and Galliano's overwhelmed ones were both stricken by superfluity. Gaultier's were not. If we set aside the "F" word (functionality) and specify superfluity only as that which does not detract and that which does enhance, then the cone bra gets a pass as well. We might also utter the "F" word in all its emphatic glory and praise Gaultier for giving us such wearable imagination. In his mid-fifties, Gaultier is less punkish enfant terrible than he is Peck's Bad Boy, a capricious scamp who invites you on a seaside holiday and delivers you home with a wink. I certainly wish more scamps would invite me on seaside holidays! That sounds like fun. I want to find the time to read the last week's worth of posts, but unless I print them up I think someone will notice me perusing this blog from my workstation. Perhaps I'll print it and read it on my ferry ride. I simply must know what's going on with that pant suit! Thom, that pansuit was a real standout for me, not in the least because it really does have a magnolia quality as worn by the outstanding Chanel Iman. I also quite liked the darker, gold-striped suit with sharp shoulder. The conceptual pieces in this collection could easily become solutions. Don't get caught reading my blog at work; someone might think you have frivolous hobbies and a creative mind. SB, I loved the way the mermaid skirts fit; I like that the skirts were slung low on the hipbone. Which is nice if one has discernable hipbones and not so nice if not. I always feel that JPG is spilling the contents of his eight-year-old imagination, which is something of which I highly approve. 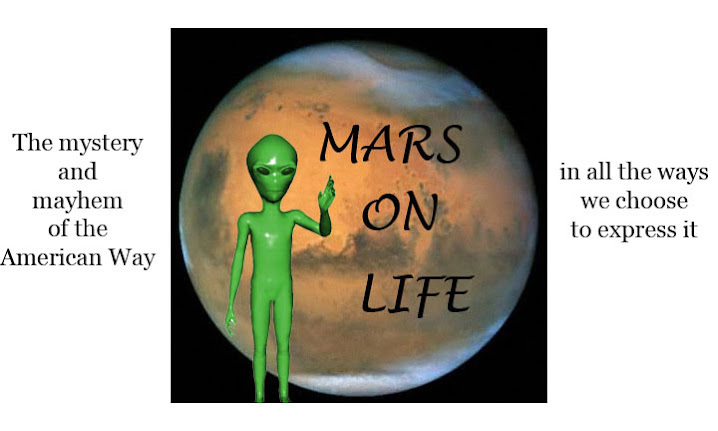 Thank you so very much for the nice comment on my blog. It made my day. Ali, my pleasure. Your blog has such a comforting vibe to it, much like spending a rainy afternoon with a favorite book and a bouquet of spring's first lilacs. NB to readers: Please click Ali's name and go see what I'm talking about if you aren't familiar. You will be charmed. "And if not tails of cod and scales of scrod, then those multicolored yet anonymous Mediterranean fish that are tossed heads and all into a proper Marseilles bouillabaise." Poetic and perfect. I love this writing style. I just read this review. I largely agree with your characterization of Gaultier. I think he, unlike many other coutouriers understand that now is not the moment for sheer provocation, or direct punk antics. Riz, it was definitely figural. But I can see application for certain pieces here and I like to think that my hipbones jut out enough to wear that look (uh huh). Interpretation, of fashion or anything else, depends on so many tiny, interconnecting dots that may be at some points strictly oppositional and at other times conflated. In this case we had a pet theme of mine (oceanic lore) combining with yet another (the theatrical) and suits that I thought were superb. There was division and some drama. But it was relatable--easily accessible motif. it is such a pleasure to read your posts. on the one hand i understand that JPG wants to get rid of his fetish image, but on the other hand it is what made him very special. i do not see sth like that in this collection. although I like the mermaid connotations.